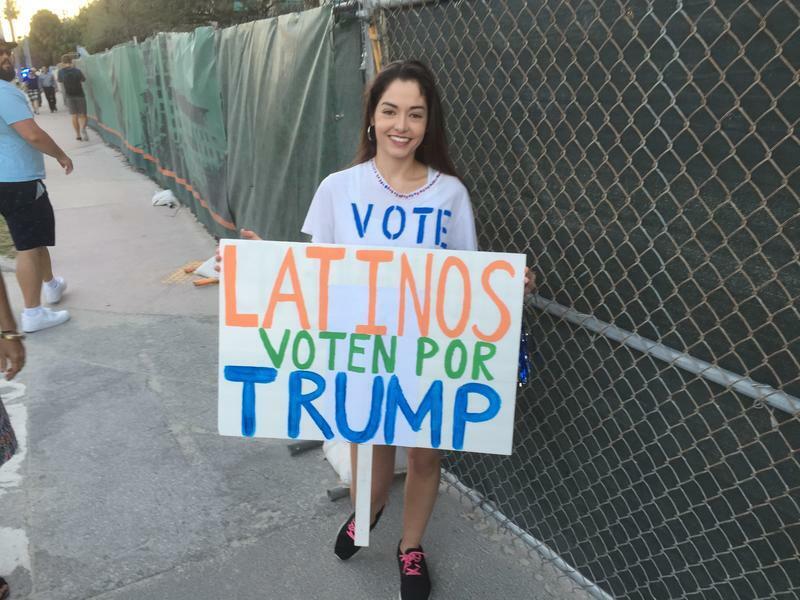 Latinos For Trump: What Were You Thinking? Cuban-American Emilia Garcia waves Cuban and Trump flags at a Tropical Park rally in Miami last Saturday. South Miami teacher Jorge Cast has his enemies of the people all neatly figured out – including the mainstream media. “My family came from Cuba, and they taught me something very basic,” Cast told WLRN last Saturday at a rally in Tropical Park in support of President Trump. As Cast talked, Trump tweeted – claiming his predecessor, President Obama, had wiretapped the phones at Trump Tower in New York during last year’s presidential campaign. No proof. Just another reckless @realDonaldTrump assertion – one even the FBI director says is bogus. But you can be sure the Trump troops believe it. Believe that black is white. Wrong is right. Just as dyed-in-the-camouflage revolutionaries back in Cuba believe whatever the communist regime tells them. Most of the 2,000 folks at the Tropical Park demonstration were Latino. Latinos, in fact, were one of the only minority demographics that cast an appreciable number of votes for Trump in South Florida – where Hillary Clinton won 2-to-1. About half of Cuban-Americans here turned out for Trump. I’m certainly not saying Latinos should have voted monolithically for Clinton. I had my own doubts about her as a candidate. But I’ll admit: this MSM chump is stumped as to why so many Latinos went for Trump. As a candidate and so far as a President, Trump not only demonizes Latin American immigrants. He evokes the same demagogic bullies Latin Americans have been coming here to escape for a couple centuries now. I see a pinata load of hypocrisy among Trump Latinos. They're doubling down for a president who oozes the same dishonest and authoritarian impulses that forced them or their parents or grandparents to bolt for the U.S. Most recently, Venezuela’s late President Hugo Chávez. If Trump were a student at Strongman Tech he’d have been expelled by now for plagiarizing Chávez’s thesis. His technique is simply an English-language version of the Caracas Caudillo. Exhibit A: last weekend’s wiretap tale. Trump’s brazen disregard for the truth reminded me of the night a decade ago when Chávez – shouting “Sh—head Yankees, go to hell!” – expelled the U.S. ambassador in Venezuela because he said he’d just discovered a Washington-led “coup plot” against him. Chávez offered no evidence because he had none. The only thing he’d “discovered” was that shouting “Yankee Coup Plot!” deflected attention away from the fact that an embarrassing corruption trial involving his government was starting in Miami. What a goshdarn coincidence that Trump tweeted his own cuckoo conspiracy last week just as his administration started sinking deeper into the Russia scandal. So I see a piñata load of hypocrisy among Trump Latinos. They're doubling down for a president who oozes the same dishonest and authoritarian impulses that forced them or their parents or grandparents to bolt for the U.S.
Three South Florida Latino groups are known for their Trump blocs: Cubans, of course, but also Venezuelans and Colombians. Trump Cubans: You turned to El Donaldo because he pledged to avenge you for Obama’s unforgivable act of normalizing relations with Cuba before you had a chance (after a half century of failure) to bring down the Castros. So far he hasn’t. Even if Trump does act, he’ll likely just chip at normalization around the edges. Not the in-your-face reversal you voted for. So what you’re left with is a U.S. president whose declarations are about as reliable as an editorial in Granma. Felicidades. A Cuban-American voters shows her support for Trump outside the GOP presidential primary debate last year at the University of Miami. Trump Venezuelans: You believed he’d be tougher on the disastrous Chavista regime, which is now a bona fide dictatorship. But he won’t be able to do much more than Obama did. Meanwhile, when you hear Trump petulantly mock jurists like U.S. District Judge James Robart, remember Venezuelan judges like María Lourdes Afiuni – whom Chávez jailed when she issued a ruling that ticked him off. She’s still on trial. Trump Colombians: You wanted a more conservative U.S. president, like former Colombian President Alvaro Uribe. Fine. You also got a U.S. leader who calls responsible media “the enemy of the people.” That’s what Colombia’s Marxist guerrillas used to call colleagues of mine they kidnapped. Fortunately, one key difference between Trump and his Latin American kindred spirits is that he’s being checked by democratic institutions like an independent judiciary. The kind that so often doesn’t exist in the countries Latinos and their families hail from. If you’re a U.S. presidential candidate – and you’re running against Donald Trump – it takes complacency or cluelessness or both to underperform with Latino voters. Hillary Clinton seems to have pulled it off. From the moment Trump launched his campaign – when he branded Mexican immigrants “rapists,” “killers” and “drug-traffickers” – he dragged Latinos through the bigoted mud, scapegoating them for America’s ills. Could Donald Trump's Mexico Insults Mean The End Of Miss Universe? Let's Hope! Like most attention-craving clowns, Donald Trump has to turn up his asinine rhetoric on a regular basis. We should of course condemn the Comb-Over King for that kind of anti-Latino bigotry. But I gotta admit: Part of me also wonders if The Donald might be doing Mexico and Latin America a strange but welcome favor. On immigration, this month’s Republican and Democratic conventions were as different as pit bulls and collies. So it's not such a big surprise that Republican presidential nominee Donald Trump and Miami Congressman Mario Diaz-Balart, also a Republican, appear to have finally slipped under the same campaign sheets.